I occasionally like to dress down but still want to look sophisticated and polished. 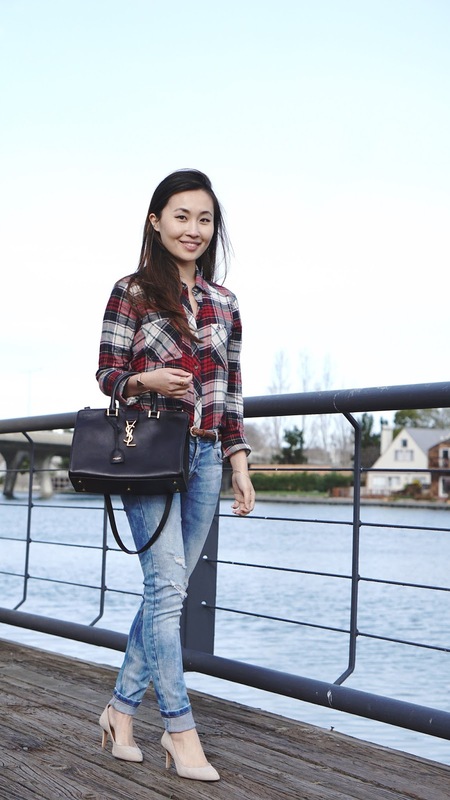 Lately, I've been pairing plaid shirts and distressed jeans with my Saint Laurent tote for a touch of elegance. With a comfy pair of pumps (these Vince Camuto pumps are super comfy to walk in! ), I can still feel dressy while looking more casual. Even though these jeans don't need tailoring, I like the folded look, especially on distressed jeans. It gives some contrast and really gives this outfit a little pop. One of my favorite jackets from Banana Republic - warm enough for spring with timeless style. Love how you mixed classic chic pieces with casually every day items.